Beadboard adds visual interest to cabinets. Beadboard paneling is a charming way to give your home an informal cottage look. Beadboard is a style of paneling that is versatile enough to be used nearly anywhere in your home. It is created from a series of thin, raised strips that are joined to make a panel. While beadboard panels recapture the charm of summer lake houses, country Victorian farmhouse kitchens, and 1920s bungalows, it also works in more elegant homes. Depending on whether it is stained or painted it becomes casual or formal, and can cover a variety of faults in vintage homes. Beadboard became very popular in the early 1900s when it was used in the more informal areas of the home. Created from wood that was left over from other projects, it became a thrifty way to add interest to various areas of the home. It still is a thrifty way to add interest today. Beadboard is not difficult to install. Anyone who can measure accurately and wield a hammer with some skill can add this beautiful accent to their home. Beadboard panels can be stained or painted in a variety of ways to match your vision for your home. When it is painted in white, cream or light beiges,it turns any room into a beach cottage. Dusty blues, mauves, or green colors give a country feel to your home. Deep burgundy or pine green can lend the feel of an elegant country manor. Beadboard paneling comes in different materials. Depending on the area where you live, you may find it made of other types of wood. There is a material to fit nearly any budget, and for any purpose. Beadboard is often used below a chair rail. Originally this protected the paint on the walls from furniture being knocked against it and causing chips. It can still be used for the same thing in homes today. When a heavy traffic area, like a kitchen or hall, is lined with beadboard, it is much easier to clean the fingerprints off the walls and prevent chips in the paint. It can also be used on a ceiling. By doing this you can easily cover up some of the cosmetic problems you may find in older homes and give the room a charming, casual look. Beadboard is especially nice on a kitchen or sunroom ceiling. Because the lines on beadboard panels can add height to a room it may be used in bathrooms and other rooms where there are a lot of horizontal lines. The vertical panels lead the eye upward and make the whole room feel larger and roomier. Beadboard is making a literal splash in the kitchen, where it can be used for cabinets, backsplashes, ceilings, and chair rails. It is a great way to change the look of a kitchen easily and inexpensively. Many designers have used beadboard paneling in imaginative ways. Seeing these pictures can help you get an idea for what you can do in your own home. If you are lucky enough to have the original beadboard in your vintage home, you should try to keep it there by making small repairs as needed. If you want to replace vintage woodwork or add it to your new construction, then architectural salvage companies and ebay are places that you should check regularly. The wood that was harvested from the old-growth forests of a century ago has a beautiful patina that is found in nothing else, and the wood grain is different from anything you can buy today. Best of all using architectural salvage in your building project is a great way to be earth-friendly. 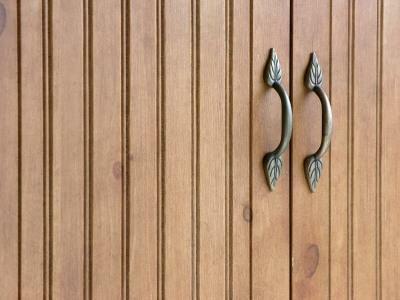 Using beadboard, vintage or modern, is an inexpensive way to add a friendly welcome to your home.